Biblioteca degli Alberi will be a 3,500m2 green space in the heart of Milan’s Porta Nuova business district. A short walk from Milan’s busy Garibaldi train station, a new library is springing up from the ground. But this library isn’t filled with books – it is a “Library of Trees”. Transforming the grey piazza in the heart of Milan’s Porta Nuova business district began with the planting of seeds in September, and will be followed by trees and plants in November. In total there will be 450 trees from 19 species, plus 90,000 plants including hedges, shrubs and climbers. When complete next year, the Biblioteca degli Alberi will be a 3,500m2 green space in the heart of a city that is increasingly returning to nature. 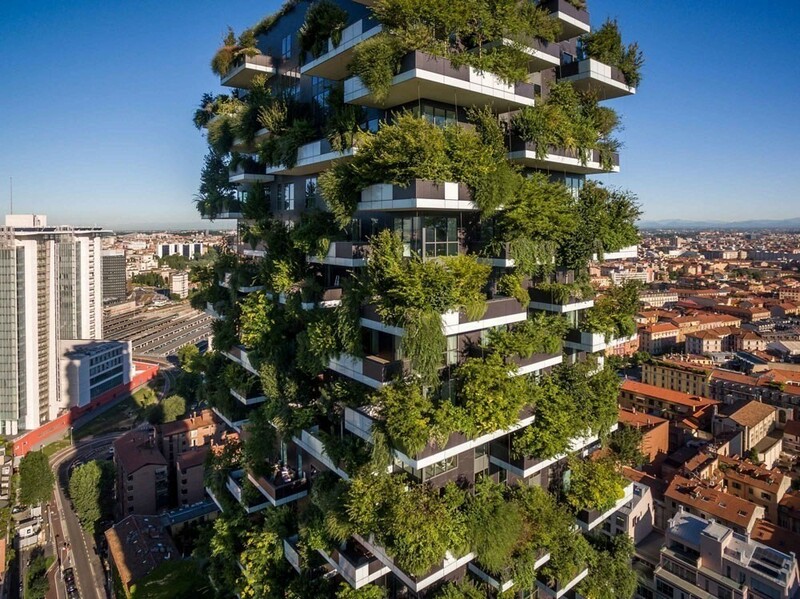 Overlooking the Biblioteca degli Alberi is Milan’s “Vertical Forest”: two residential tower blocks built in 2014 that are covered in 800 trees, 4,500 shrubs and 15,000 plants. If this forest was planted on the ground, it would cover 20,000m2 – the size of three and a half football pitches. Designed by architect Stefano Boeri, the vertical forests concept has proven so popular that similar projects have been commissioned for Lausanne in Switzerland, Utrecht in the Netherlands, and the Chinese cities of Nanjing and Liuzhou. The proposed Liuzhou Forest City is the most ambitious project yet: a new town with homes for 30,000 people, where buildings will be covered by 40,000 trees and 1 million plants. Each year the trees will absorb 10,000 tonnes of CO2 and 57 tonnes of pollutants. They should also produce about 900 tonnes of oxygen. Reducing pollution and increasing biodiversity have been two of the key themes driving the popularity of foliage-clad buildings in cities across the world. 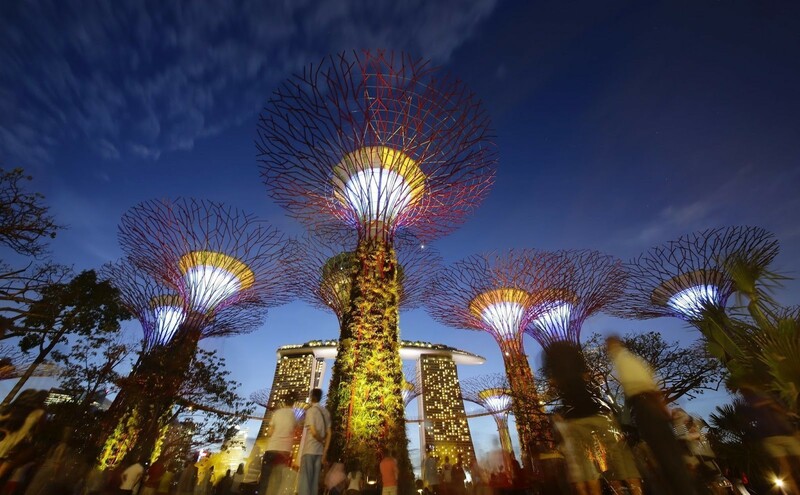 Singapore’s Bay of Gardens features 18 “supertrees” – man-made structures between 25m and 50m high that are home to solar panels, light displays and thousands of plants. The large canopies operate as temperature moderators, absorbing and dispersing heat. They also provide shelter from the hot Singaporean climate to visitors walking beneath. But it is not just physical wellbeing that is aided by large green structures in our cities. The team behind Sydney’s 100m high “vertical garden” claims it is a new form of “living architecture” that reminds us of “the restorative impact that nature has on our souls”. Just how restorative living near trees and plants is for our souls is open to debate; but studies in Germany have suggested that it can be extremely beneficial for our brains. Scientists examined brain image sequences of 341 elderly residents of Berlin, focussing particularly on the amygdala – the part of the brain that controls our fear responses and is responsible for stress and anxiety disorders. They found that there was strong correlation between residents living within 1km of the forests on the edge of the city and those with the healthiest amygdala. A healthy amygdala means being less prone to the stress and anxiety disorders controlled by this part of the brain. Mood and anxiety disorders, as well as schizophrenia, are up to 56% higher in urban environments when compared to rural locations.